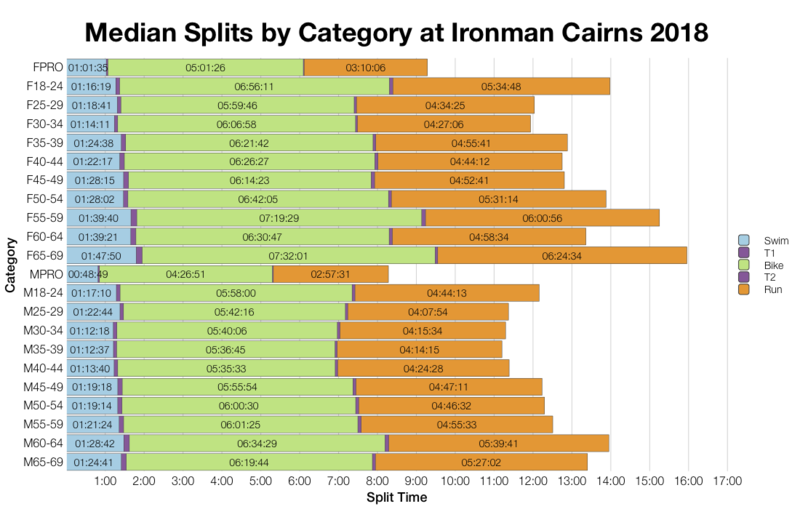 The other Ironman race of the weekend was the Asia-Pacific Championship in Cairns. 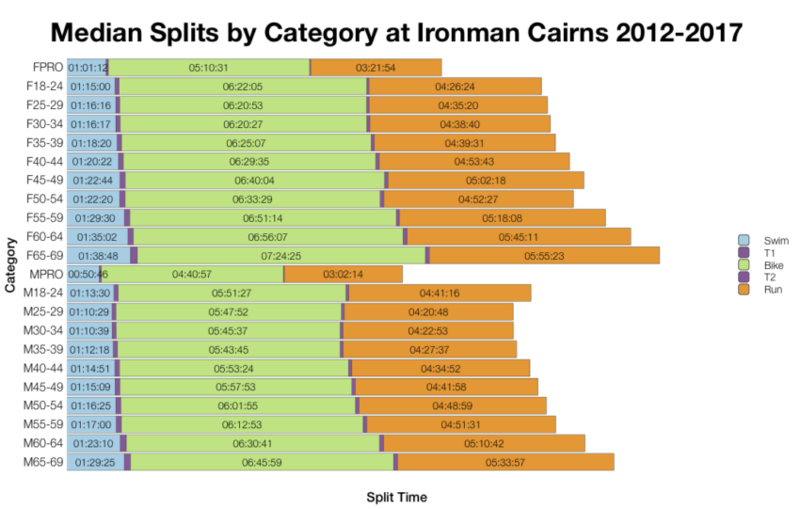 Ironman Cairns is a smaller race, with just over 1,000 competitors, but as a Championship it comes with 80 Kona slots fo the age groups. On paper that reads like good odds, but qualifying still takes a respectable time. 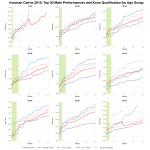 Comparing the distributions of this year’s results with those from the previous six years shows similar patterns. 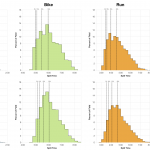 The greater bulk of data in the older results smooths the curves out more, but checking median and other percentile timings places these results closely in line. Perhaps the median splits are slightly faster than usual, but it’s a very small margin if so. Most years I’ve managed to obtain clear DNF and DNS numbers for the race, so I’ve got quite an accurate history of DNF figures for Cairns. This year looks to be at the high end of DNF numbers for the race (2015 figures include DNS and DNF). 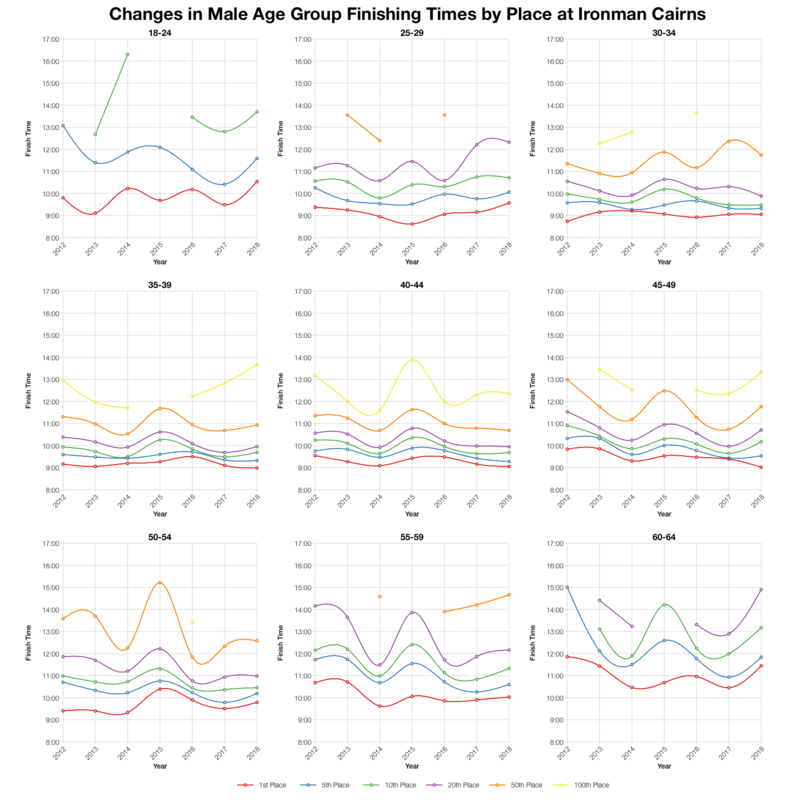 As with the distribution, most age groups follow a similar pattern with median splits lining up closely with previous results OF course at the age group level there’s some variation, especially when a particular division is small. Cairns draws quite a broad field, mostly from the Asia-Pacific region though. While most slots stay at home, Japan and New Zealand take the next biggest shares. 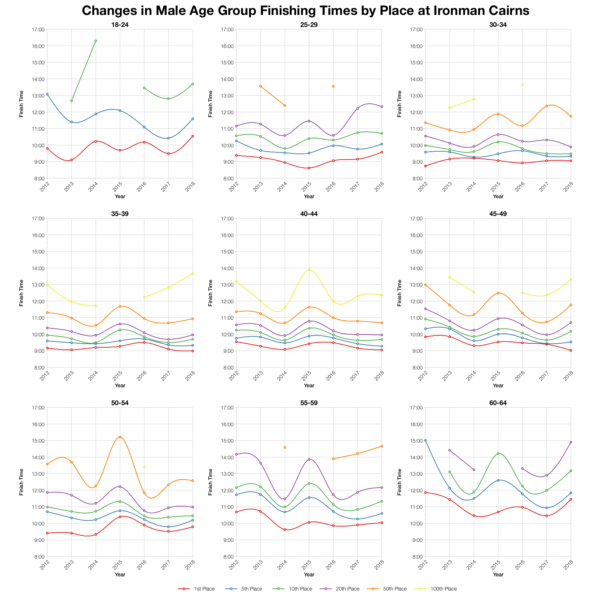 There’s been a lot of variation in times for age group placing in Cairns. As with most races, this is not so much at the very front, but more noticeable further back. some of this comes from the variance of a smaller field. Some from variations in course and condition over the years. 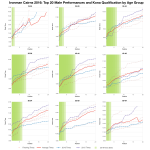 At least when looking towards the front portion of the race times fall in line with the last couple of years. 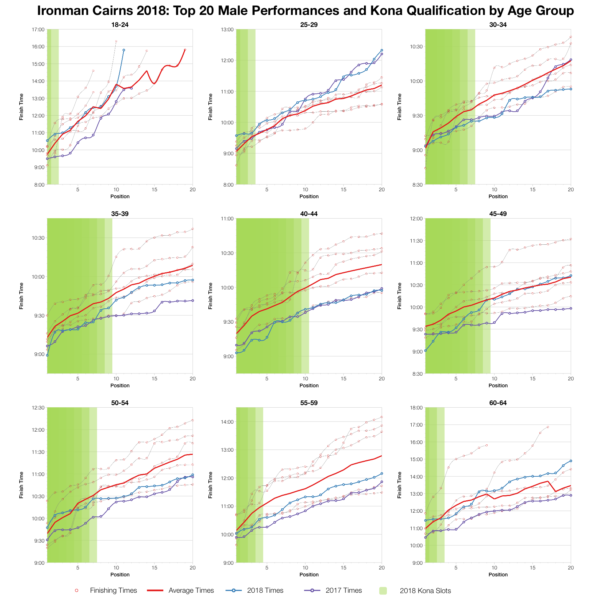 Based on the slot count and start numbers I’ve estimated the slot allocation at this year’s race and from that the automatic qualifying times in each age group. Exact numbers may vary and roll down will affect final qualifiers. You can compare tis with other races on my Kona qualification page. 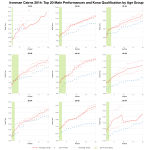 Finally, the top twenty times for each age group. There’s some variation, but times fall mostly ahead of the average and within close range of the 2017 results. the last few years seem to have been quite consistent with respect to likely qualifying times. 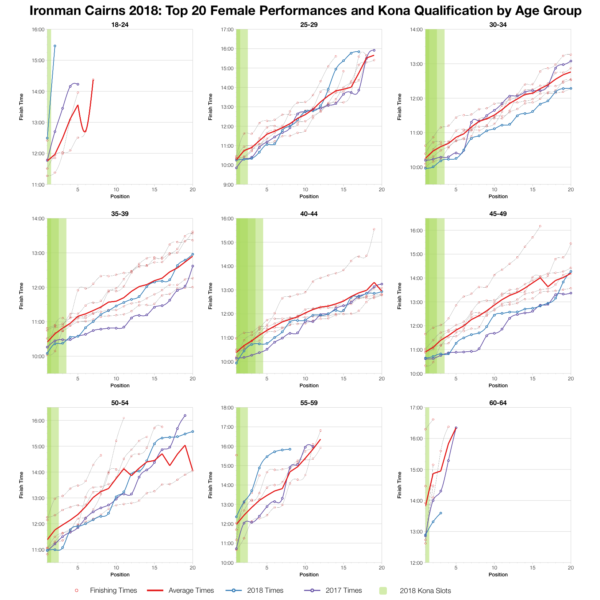 You can access a spreadsheet of the full results from Ironman Cairns 2018 on my Google Drive.